Jeff Koons Cracked Egg (Blue) a large two-part stainless steel sculpture from the Celebration Series, which began with Balloon Dog in 1994, is the first of five versions, each one rendered in a vivid colour. This is blue, or I might myself have called it turquoise. Either word feels inadequate. I came across the egg, unexpectedly, in the auction room. 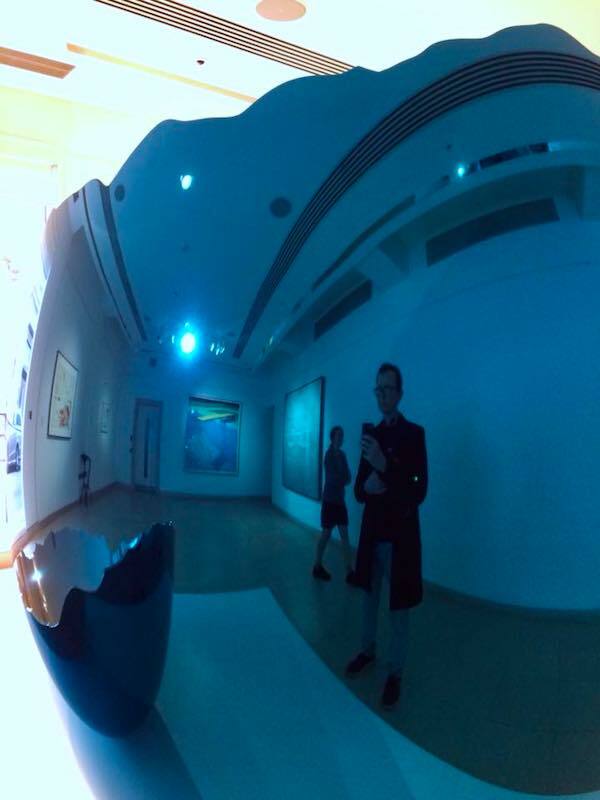 My friend Doug reflected in one part, me in the other, our four reflections stared back at us in these polished surfaces with their different distorted personalities. I had recently been to the Space Shifters exhibition at the Hayward Gallery containing highly technical mirrored works, and I am accustomed to seeing my own reflection in works of highly manufactured pieces but to stumble on this broken beauty was eye-shattering. Koons’ work turns banal objects into high-art icons, and I had met one of his gold balloons previously in New York. Then I had thought about Andy Warhol, readymades and advertising finish. I read the commentary. ‘Look, it’s the Jeff Koons,’ my friend had whispered. I knew the aesthetic philosophy, what the critics generally said. I was prepared to experience a standout piece of pop art. But the egg was different. I was lost in Alice in Wonderland. Humpty Dumpty was there and all the king’s men. This was an egg, the beginning of all things, the lost Easter promise, empty and beautiful. An egg that contained no life to break out, one that was just for me, my egg. I would put that egg in my bedroom, curling inside it every night like a foetus. Not literally of course, but it was a benign hall of mirrors for my psyche to stare at itself. This egg has not hatched, its cracks were those of an egg broken by spoon so that the human could stare inside and gobble up the delicious yellow yoke. I had never felt so close to a piece by Koons. I had previously skimmed off the surface and skated away, repelled like water off a duck’s back. I had been over-reflected from the pop art and ricocheted back into my natural home of grime, dirt, reality. Where I felt at home. I have never been a child of the luxury item, the genteel finish, the polished table. Today that changed. Was it the colour and shape that changed the experience for me? Or was it the surroundings? It was a privilege to see the work at the auction house. The intimacy with which one can be with desirable objects, often before they are lost to private collections forever, is fierce there. The work has space to breathe, and so do you. Also, the eclectic assemblage is surprising. I hadn’t known I was going to be standing in a smallish gallery space, up close with a Koons egg. So the quality and sheer gorgeousness was more intense than I could have wished. My eyes almost felt as they were burning and were slightly awash with tears. I had what I call art shock, that visceral vibration that seems to sear the iris as my colour sensors were energised. I fear that by trying to describe it, I am becoming a candidate for Pseud’s Corner when I just wanted to convey that the surface of art can stimulate me like crazy, especially when the artist is Jeff Koons. P.S. Jeff Koons‘s A Cracked Egg (Blue) (1994–2006), from his “Celebration” series, ran with an estimate similar to the last work from this series sold at auction, in 2014, for £14.1 million ($18.4 million). The only bidder this time around at Christie’s was Stefan Ratibor of the Gagosian Gallery who stopped bidding at £8 million ($10.4 million) below the £10-15 million ($13–19.5 million) estimate. – UNSOLD! 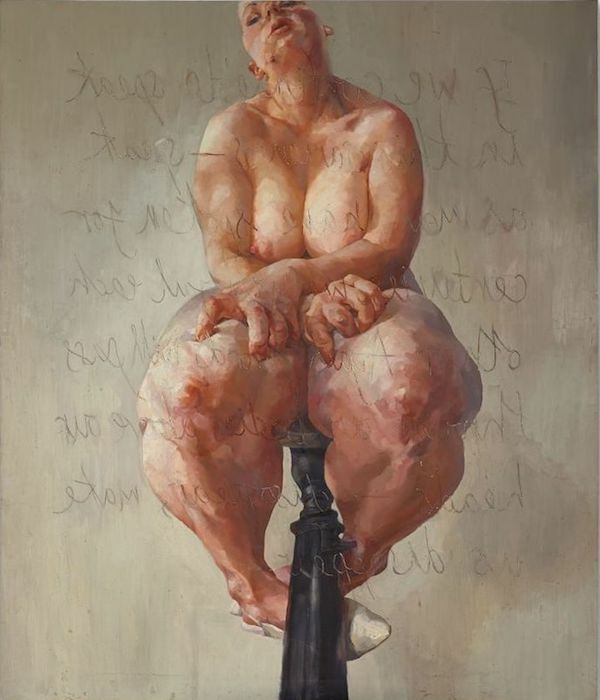 Jenny Saville’s Propped (1992) fetched £8.25m (£9.5m with fees) at Sotheby’s. This was double the high estimate and is now the most expensive work by a living female artist at auction.